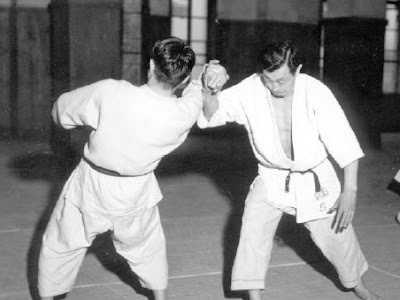 Kenji Tomiki developed the Junana Hon Kata (Seventeen Fundamental Forms) based upon the countless aikido techniques that he'd been taught by Ueshiba. These seventeen basic aikido moves form the core of Tomiki aikido in most clubs in the Tomiki lineage. Following is an outline of the seventeen techniques, along with some pointers to articles I've written over the years about each technique. I was surprised to find that in all my archives, I have written next to nothing about the three floating throws in the Tomiki system. I expect to fix that right soon, but in the meantime, here is an article about the class of floating throws in general and here's another one.